University of Maine at Presque Isle President Ray Rice has announced that U.S. Senator Angus King will deliver the commencement address during the University’s 109th Commencement Ceremony, to be held on Saturday, May 12, 2018. During the event, Senator King will also be presented with an Honorary Doctor of Humane Letters Degree. 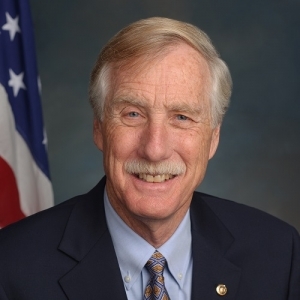 Senator King was sworn in as Maine’s first Independent United States Senator in January 2013, filling the same seat once held by storied Maine leaders Edmund Muskie, George Mitchell, and Olympia Snowe. Joining the long line of thoughtful, independent leaders from the State of Maine, he works to bring Republicans and Democrats together to find common-sense solutions for Maine and America. Senator King is a member of the Armed Services Committee, the Select Committee on Intelligence, the Committee on Energy and Natural Resources, the Committee on the Budget, and the Committee on Rules and Administration. He has made it a priority not to miss Committee hearings, earning him praise from his colleagues and the reputation as a workhorse in the Senate. Armed Services Chairman John McCain (R-Ariz.) once called Senator King “one of the most serious and hard-working members” of the Committee. 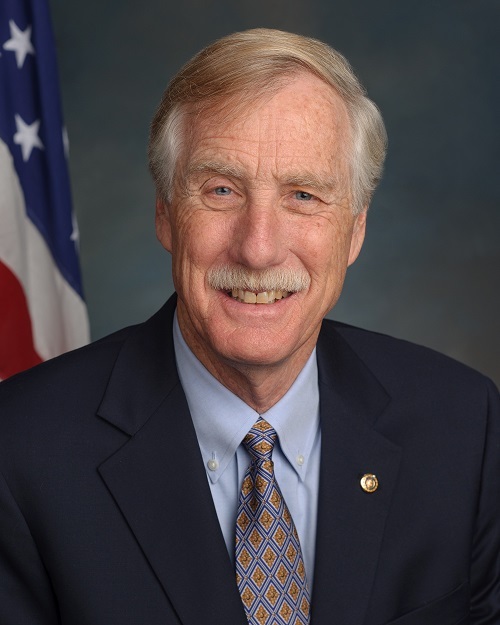 In his time in the Senate, Senator King has worked to strengthen America’s national security, conducted critical oversight of the nation’s Intelligence Community, supported common-sense budget priorities that promote prosperity and reduce the national debt, fought the national opioid and heroin epidemic, coordinated efforts to revitalize Maine’s forest economy, fought to improve access to health care, worked to strengthen the government’s support of veterans, and promoted increased access to critical community resources like rural broadband. Senator King has already achieved significant legislative victories. In 2013, when students across America faced the financial threat of a significant increase in their student loan interest rates, he spearheaded the effort to draft and pass through both the Senate and House the compromise legislation that not only averted rate hikes, but also put the program on long-term stable financial footing. The Student Loan Certainty Act of 2013, has since been projected to save millions of students across the country more than $50 billion in interest payments. During the government shutdown of 2014, Senator King worked tirelessly with a small group of moderate senators, led by his colleague and friend Senator Susan Collins, to formulate the action plan that eventually led to the reopening of the government. He also tries to informally bridge the partisan divide in Washington by frequently bringing his colleagues on both sides of the aisle to his home for barbeque dinners, where political talk is banned and the focus is getting to know one another. The bonds that are formed through these relationships often lay the foundation for successful legislation. Senator King also served as the 72nd Governor of Maine, and during his two terms in the Blaine House, he focused on economic development and job creation. Then-Governor King also achieved significant reforms in education, mental health services, land conservation, environmental protection, and the delivery of state services. He was re-elected in 1998 by one of the largest margins in Maine’s history. Senator King is married to Mary Herman and has four sons, Angus III, Duncan, James, and Ben, one daughter, Molly, and six grandchildren. He was born in Virginia and attended Dartmouth College and the University of Virginia Law School. The University’s Commencement Exercises are scheduled for 10:30 a.m. on Saturday, May 12, in Wieden Gymnasium. This year’s Commencement will be live streamed on the University’s website. Viewers can directly access the livestream starting at 10 a.m. on graduation day by visiting www.umpi.edu/livestream.